In Europe ExxonMobil is spending billions of Euros every year to hold back climate action in the EU, while in Asia communities living in the sixteen downstream countries of the ten rivers that rise in the Hindu Kush region of the Himalayas face increasing problems with food production and incomes as a result of climate change. In the USA forest regrowth after bushfires is also threatened by climate change. And yet recent research demonstrates that action on climate change makes social, environmental sense and economic sense. An initiative by Melbourne City Council produces unexpected heart-warming results. It is well known that tobacco companies were aware for decades of the harms done to people’s health by smoking. To prevent and then delay action to reduce smoking (with great success it should be noted) they used a range of techniques to manipulate information about smoking that was available to the media, the public, policy makers and politicians. The lessons they learnt (and continue to use globally) have subsequently been adopted by junk food and alcohol producers, gambling organisations and fossil fuel companies. A recent report by Corporate Europe Observatory (CEO), a group that exposes and challenges ‘the privileged access and influence enjoyed by corporations and their lobby groups in EU policy making’, details the many activities used by ExxonMobil (US$20.8 billion in profits in 2018) to deny the existence of climate change, deny any responsibility for global warming and delay and weaken climate action policies in the European Union. They spend billions of Euros every year on lobbying and schmoozing politicians and bureaucrats (both directly and via a range of trade associations and consultancies) and funding thinktanks. Good to know nothing like that happens in Australia. In a couple of previous posts I have referred briefly to shrinking Himalayan glaciers and the effects on water security in surrounding countries and also to the threat of armed conflict between Pakistan and India. Future Directions International, a not-for-profit organisation that provides ‘ … balanced research […] that will enhance the quality of strategic decision making’ in Australia, has provided a detailed assessment of the risks posed by climate change to the sixteen countries supplied by rivers starting in the Hindu Kush region of the Himalayas (HKH). Compounding these risks are those posed by economic development, urbanisation and deforestation. The ten major river systems that rise in the HKH deliver water to a fifth of the world’s population, many of who already face shortages of water, food and energy, particularly in South Asia and northern China. Reduced river flow, increased temperatures and changes in rainfall patterns will further threaten food production and farm incomes. David Wallace-Wells is Deputy Editor of New York magazine. He regularly writes about the dire situation we face with climate change and its catastrophic consequences. In this 8-minute interview with Chris Hayes on MSNBC he emphasises that climate change is not simply one issue among many but is an all-encompassing threat that will affect everyone all over the world, regardless of where you live and how wealthy you are. He clearly describes the challenge of getting all nations on board with meaningful climate action but highlights recent research that establishes the economic sense of decarbonising. A thriving economy, jobs and the climate action lie on the same path; a prosperous and climate-safe future is possible. Mature native trees of the American West, Ponderosa Pines and Douglas Firs, are able to survive in the warmer, drier air that is associated with climate change. But research has demonstrated that following wildfires (which are burning across increasing acreages in the USA) the changes in summer humidity, surface temperature and soil moisture are making it difficult for young trees to root and thrive. This could lead to rapid transitions from forest to non-forest with consequences not only for the loss of ecosystems but also for reduced removal of carbon dioxide from the air by the trees and hence exacerbation of global warming – a vicious cycle. Finally, a tree story from the ABC that restored some of my battered faith in humanity’s capacity to live harmoniously with the earth’s 8 million or so other species. 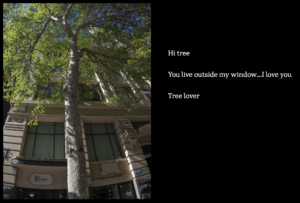 Melbourne City Council has given all the trees in its area an email address so that concerned people can report any tree problems. But people all over the world have started sending questions, fan mail and personal messages (of love, appreciation, concern, guilt even) to the trees. 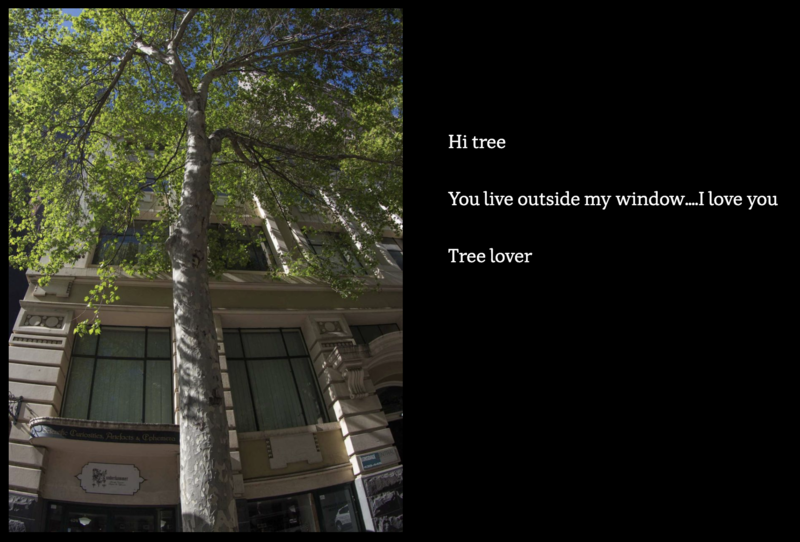 Visit the Urban Forest Visual website to establish your own online relationship with an arboreal friend.